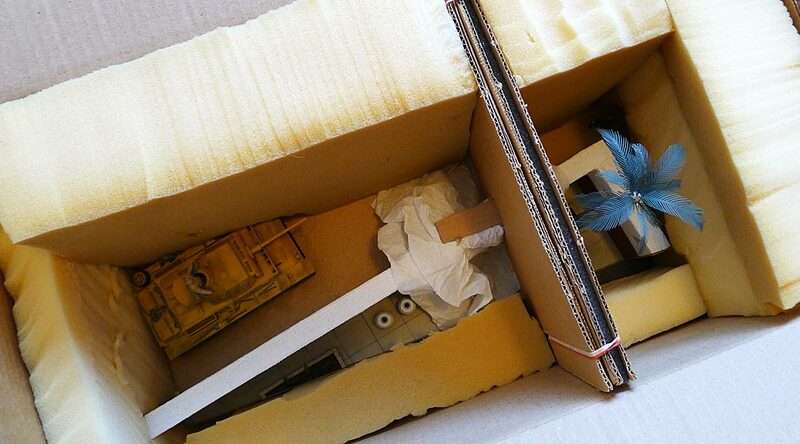 It was with a bit of trepidation that I began packing a diorama for shipment to a museum. My concern of course was that it would be damaged in transit and end up in several pieces. I found myself wondering if a note to the museum staff saying “some assembly may be required” would be in order. Following the mantra “hope for the best and prepare for the worst,” I decided to plan for the worst case scenario: a disgruntled postal worker who has misplaced his winning lottery ticket decides to take out his frustrations on a large parcel labelled “fragile.” How to prepare for this scenario? The most common indignity suffered by large parcels is that they tend to be thrown rather than picked up and carried. They’re also liable to be crushed under heavier parcels. So packaging should provide (1) shock absorption and (2) rigidity. When packing a simple object with a hard surface (for example, a glass vase), shock can be absorbed by wrapping the object in several layers of foam, fabric, or bubble wrap. This is fairly easy to accomplish. 2. Create a “cradle” for the diorama by cutting foam to fit the bottom and all four sides of the box. The foam will provide shock absorption during shipping. It can be cut with a long, sharp kitchen knife and sharp scissors. Always wear gloves. 3. Make a bulkhead to provide resistance to crushing. The bulkhead, which you can see in the middle of the box, was made by sandwiching several layers of cardboard and foam together. It straddles the wall featured in the diorama, which is a hard, non-fragile surface. 4. Complete the packing by cutting pieces of foam to fill most of the box, supporting the bulkhead. Leave space around fragile parts (palm tree and figures). I don’t recommend gluing any foam pieces, bulkheads, etc. in place since this will make it more difficult for the receiver to remove the diorama from the box without damaging it. Instead, cut the foam pieces to a tight fit so they interlock and stay in place. 5. Use transparent packing tape to seal the box. Substituting green painter’s tape or some other tape may result in the tape peeling off during shipping, especially in humid conditions. 6. You may wish to put some “fragile” and “this end up” stickers on the parcel, although no-one knows if these actually make a difference! This is not something you want to rush. I spread the work over a couple of days. You’ll feel much better knowing that you’ve done everything to ensure that your diorama will arrive at its destination with a minimum of damage. By the way, postal services in some countries require inspection of parcels prior to shipping internationally. If you live in such a country and are exporting your diorama, don’t seal the box until you’ve brought it to the post office. There are never any guarantees with the postal service, but if you follow these steps, your diorama should have a safe and pleasant journey to its new home.